Live to eat or eat to live? Whether you find yourself in a survival situation or just want to try a few backcountry delicacies, expand your outdoor knowledge with this guide exploring some foods that can be foraged, nutrition information, and preparation ideas. 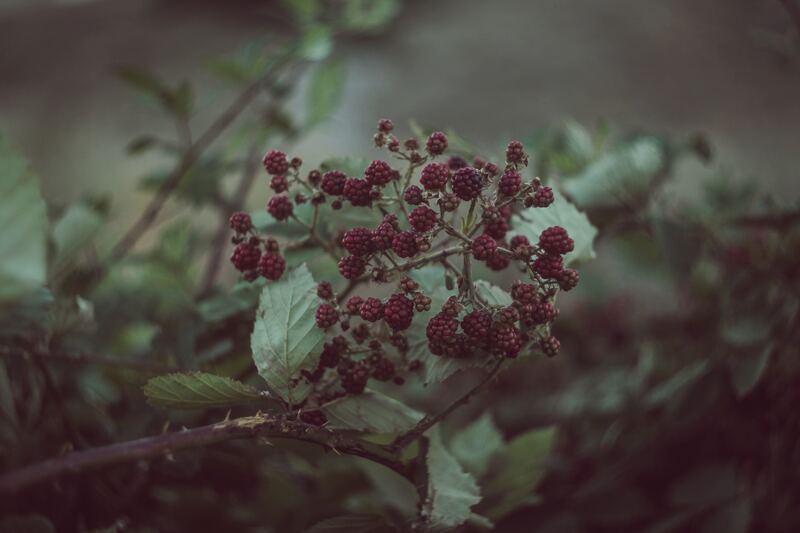 If you missed the previous part of this guide about wild edibles, you can find it here. Disclaimer: Make sure you are confident in the identification of plants, and when in doubt, do not eat it. Also be sure to look at the surroundings of where these plants are grown. Do not harvest from places that are contaminated. Avoid any areas sprayed with pesticide, herbicide, or other chemicals. If you are on medication, consult with your doctor or pharmacist before eating wild edibles, as some foods may interfere with medication safety or efficacy. 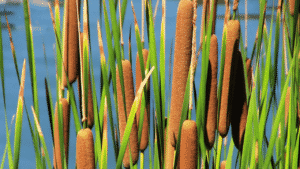 The cattail is a widely available wild edible—it can be found in marshy areas or around ponds, rivers, or lakes and is native to all states except Hawaii. It is often referred to as “the wetland supermarket”, since the list is long for how various parts of the plant may be used for food or another resource. No other plant, in its mature stage, looks like the cattail. It is often 6-7 feet tall (up to 9 feet) with leaves that attach at the base of the plant in an oval shape. The backs of the leaves are rounded and strap-like, and the plants are topped with a cigar-shaped blossom with densely packed flowers that turn brown. They are mild tasting, without much aroma. If possible, harvest cattails from a large stand, as opposed to a place with only a few, to limit impact on the ecosystem. They are a good source of vitamin K, manganese, and fiber. Believe it or not, even the gelatinous starch that you will find on your hands while harvesting these can be used to thicken soups. 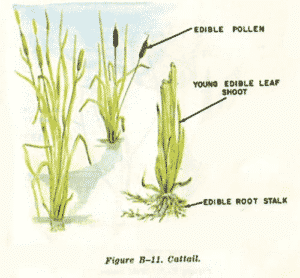 Simply pull diagonally at the base of the cattail, and the shoots should separate from the rest of the plant. The young, green and tender tips, of the shoot can be eaten, as well as the white bottom of the stalk, with a taste resembling cucumber or zucchini. The spurs and rootlets coming off the roots are also edible. The shoots can be eaten raw, sautéed with other wild edibles, or boiled or steamed like asparagus. The cob-like tips can also be eaten when they are young like corn-on-the-cob. They can be found in a stalk like corn. Pull back the outer husks. The top portion produces pollen later in life. Boil the stalk—both upper and lower cob-shaped portions may be eaten. During the middle of summer, cattail flower heads open, and a golden yellow pollen can be harvested. The pollen can be used as a nutrition and flavoring additive. It can be added into baking flour at home or sprinkled on top of yogurt or cereal. It can also be added to water to make dough or as a thickener in soups. It can be frozen or dried. If the plant has the brown flower, you have missed the pollen stage. The rootstalks can be eaten, as well by removing their outer covering and grating the white inner starch. Boil or eat them raw. The roots come in at about 150 calories per cup. Once the brown flower heads become more white and cottony, the down can be used as tinder for a fire starter. It burns fairly slowly and actually gives off a natural insect repellent. The dried spikes at the top of the plant can also be used for fire. The leaves can also be made into baskets or ropes. How about some irresistible fish bait? Pick out a green stalk and look for an outer leaf with a brown base. It may have a beetle grub large enough for a hook and sure to catch a fish. Give this Cattail on the Cob Recipe at try! 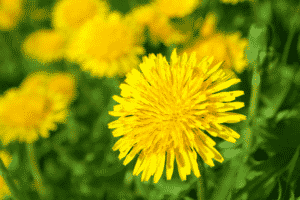 Another wild edible is the dandelion. The flowers, leaves, and roots are edible raw or cooked. The flowers are used to make wine or a kind of broth. They only have 25 calories per cup but are rich in vitamins and minerals, including vitamins A, C, and K and calcium. Give this Dandelion Pumpkin Seed Pesto Recipe a try! Berries are a sweet, delicious wild edible high in vitamin C and other powerful antioxidants. An easy way to harvest berries is by placing a plastic sheet underneath the shrub or tree and shaking it. Only the ripe berries will fall. Berries can also be frozen for later use—first wash and dry. It can be helpful to wear closed toed shoes, pants, gloves, and long-sleeved shirts when berry picking. They are usually ripe mid to late summer. Again, be sure of the berry you are eating before harvesting it. It can help to scope the patch out during the spring and identify the flower to then confirm the identification of the berries in the summer. Check out this article on identifying poisonous berries to learn more. 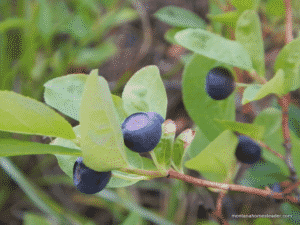 The huckleberry shrub will usually grow to between two and four feet tall. Its leaves are oval shaped with smooth edges and are arranged alternatively on the twigs. The berries resemble blueberries but have more of a crunch, due to their seeds. Give this Huckleberry Swirl Lemon Ice Cream Recipe a try! Blueberry bushes have a variety of sizes, ranging most often between 2 and 10 feet tall. At the base, bushes have multiple smooth, thornless branches growing out of the soil in clumps. The leaves are somewhat egg shaped, being wider at the bottom than the top and are green or bluish green. The berries have a five-pointed crown. Blackberries have many lookalikes, but none of them are dangerous. Some lookalikes include the olallieberry, marionberry, boysenberry, and loganberry. 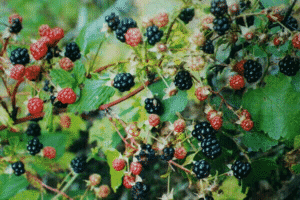 Blackberries grow on thorny and dense shrubs that commonly grow up to 13 feet tall. The berries start out white then become red and ripen when black. They are an aggregate berry and have multiple drupes that keep their cores when they are picked. Raspberries look similar, colored red or black, and leave their cores behind. Sunflower seeds can be found at any grocery store or gas station, but did you know that the entire plant is edible? Sunflowers bloom midsummer into fall. Sunflower leaves, either alone or with its roots and petals, can be brewed to make tea. Very young plants called microgreens can be harvested just after they have shed their shell and are two to four inches tall. Sunflower petals are a bittersweet, colorful addition to salads with their leaves and microgreens, and young flower buds are delicious steamed. Sunflower stalks can be eaten like celery—dip them in peanut butter to increase your snack’s calories, protein, and healthy fat content. Roots can be eaten raw or after being roasted or steamed. Harvest sunflower seeds in the fall when the sunflower’s petals have dried and begun to fall, and the base of the bloom’s head is yellow or brown. Cut the bloom off the stem and rub the loose seed shells from the head of the sunflower and let them dry. 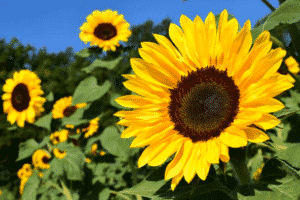 The seeds can be eaten raw or roasted or ground to make sunflower butter. These seeds are an excellent backcountry food, as they are full of nutrient-dense energy. One ounce contains 170 calories and provides a strong source of healthy fats, fiber, zinc, folate, B vitamins, phosphorous, and vitamin E and some protein. The seeds also contain an essential nutrient called choline. Choline is important for healthy cell structures, as well as the production of acetylcholine, a neurotransmitter that impacts memory, mood, muscle control, and other nerve and brain functions. Give this Super Seedy Sunflower Butter at try! 6. Kavanagh & Leung. (2017). Edible wild plants: A folding pocket guide to familiar North American species. Waterford Press.